After the release of 'McCartney II' Paul regrouped Wings for rehearsals and recording in October 1980. He was still undecided on how to carry on with the band and, lacking sufficient direction in the sessions, he called upon his old friend and producer George Martin to take charge and they got things back on track until the morning of 9th December when Paul heard the news from New York City that his best friend, collaborator and fellow ex-Beatle John Lennon had been murdered. Quite understandably, Macca and George Martin put a hold on further sessions for this album in order for him to grieve for his friend. Of course, when confronted by press mere hours after hearing the news, Paul was typically non-committal about John's death, his parting words to the camera being "It's a drag, isn't it?" which sparked off outrage at his seemingly non-caring attitude. In reality, Paul was seriously trying to keep it together on Oxford Street that day. A Drag: Paul was confronted by the press on London's Oxford Street mere hours after hearing the news. You Never Know Who May Be Listening To Ya: Paul & Ringo perform 'Take It Away' for the 1982 promotional film which also starred John Hurt and George Martin. The album, like most of Paul's releases from the 1980's suffers from its dated moments and the two glaring songs are 'What's That You're Doing?' and 'Ebony And Ivory' which are both with Stevie Wonder. It definitely seems that Paul works best either alone or with John Lennon. Another song which would probably seem dated to people today is 'Dress Me Up as A Robber' which is one of my favourite tracks on the album for it's falsetto vocals and ringing bass line. The album's eponymous opening track was a beautifully orchestrated affair which half of Paul's fans put on a par with Lennon's 'Imagine'. The track that really brought Lennon fans back to McCartney though and more than made up for his off-the-cuff comment was 'Here Today' which is an acoustic, heartfelt tribute to his friend referencing their relationship during the Beatles. 'Somebody Who Cares' is a good sing along track and as I write this, I can't get the chorus out of my head 'The Pound Is Sinking' was probably a throwaway song but again Paul proves his worth by fitting a melody around the words and, to quote an American friend who listened to the song, his "silly British stuff". 'Ballroom Dancing' and 'Wanderlust' are two songs that I believe Paul should do live again. Side by Side on my Piano, Keyboard, Oh Lord: Paul & Stevie in the 'Ebony & Ivory' video in 1982. 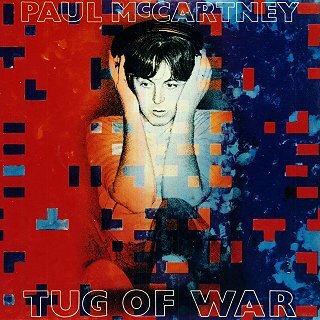 'Tug Of War' was released in April 1982 hitting the number one spot worldwide and restoring much of the critics faith in Macca. Some had thought, rather wrongly, that they'd seen the last of Paul McCartney.